Violin Play-Along Volume 64. By Lindsey Stirling. Violin Play-Along. TV, Movies, Pop. Softcover Audio Online. 24 pages. Published by Hal Leonard (HL.159634). 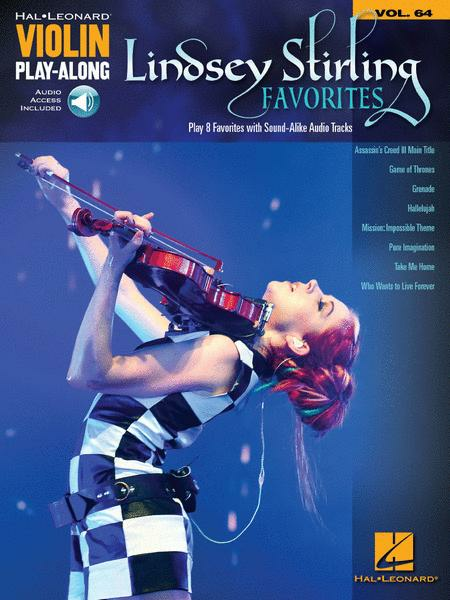 The Violin Play-Along series will help you play your favorite songs quickly and easily. Just follow the music, listen to the online audio to hear how the violin should sound, and then play along using the separate backing tracks. With the melody and lyrics included in the book, you may also choose to sing along. The audio includes PLAYBACK+ features that allow you to loop passages, change the tempo, and more. This volume includes: Assassin's Creed III Main Title • Game of Thrones • Grenade • Hallelujah • Mission: Impossible Theme • Pure Imagination • Take Me Home • Who Wants to Live Forever.